This is a Fly – in – Fly out canoe trip. Starting here at Sabourin Lake you are just minutes away from one of Canada’s celebrated “Heritage Rivers”, the Bloodvein. Situated on this lake is a beautiful full service lodge. You may want to consider starting your trip with a nights stay to take in some pampering and fill up on their famous pie. What kind you ask, well just about any kind you can think of. Moving away from Sabourin Lake Lodge you will be traveling upstream to where the Simeon Creek enters the Bloodvein. Don’t let the word upstream worry you. The system is a lake to lake and the current is slow and plodding. While on Sabourin and Simeon Lakes you may encounter boats from the lodge but you soon leave them behind once you walk over the hill to South Simeon Lake. The stretch between South Simeon Lake and Dunstan Lake can be shallow in late August if it’s a normal year, but even that just means you have to get out and pull over a few rocks. Since you are traveling upstream this is almost a certainty if the water is low. I remember floating through this area one August, but I was headed downstream and didn’t displace as much water. Oh, did I mention the walleye fishing is fantastic! Dunstan Lake is a typical boreal scene. The forest is older with granite peaking at you everywhere. The portage south out of Dunstan Lake, although one of the longest of the trip at 750 metres, is one of the most pleasant in the park. Called the “enchanted forest” it’s a smooth meditating walk on lichen encrusted sand that holds jack pine as tight as it can. Merging with the main trail are many game trails commonly walked by our parks namesake. As quickly as you leave the sand at the end of the portage you find yourself wadding through the bog to get to open water (just want to prepare you)! Once at the end of this lake you have a decision to make, left or right – east or west? It doesn’t matter which way you choose, roughly the same number of portages, roughly the same distance; so what’s the distinction? One is more of a lake to lake, bedrock system and the other is a meandering creek and lake system. One has walleye to find the other lake trout and northern. A quiet paddle on one will reward you with moose, but be careful; if you travel too quietly you will sneak up so quickly and be so close that you’ll startle a feeding moose. Sometimes a startled moose makes a mad moose! A quiet paddle in the opposite direction may reward you with a caribou sighting. So take your pick and flip a coin. Let’s go left or east first. After a small creek system you will end up heading south east on a lovely narrow chain of lakes. After a 900 metre walk you end up on what I consider to be one of the finest jewels of the area, Royd Lake. Halfway down Royd Lake you take the westerly bay and run towards Donald Lake through another small lake and creek system. On Donald Lake there exists some private land so motorboats will be present. Donald Lake has been designated as an air access zone to consolidate the motorized traffic, both from the air and on the water. Ok, let’s go the other way. Start back where we turn right or west this time. After another small creek system you will find Wanda Lake; have you seen any moose yet? If its mid afternoon, stop – fish – eat and camp, good choice. The next day you will begin to float downstream towards Terry Lake. How many moose have you seen now? How much time do you have, are you ahead of your predetermined pace? If you are, at the junction, head south into Terry Lake. It’s a nice little lake where the fish aren’t so. Carrying on down the creek system takes you to a small lake and back into the creek system again to a bigger lake. You must have your socks off, using your toes to keep track of the moose you’ve watched by now! You are now on the last stretch to Carroll Lake. Besides the portages shown on the map, know that you will also have to pull over a number of beaver dams while on route. The very last stretch now from Carroll to Donald has a nice little waterfall called “Little Niagara”. 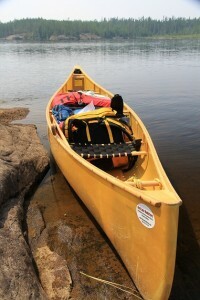 You will find it on the northerly channel coming out of Donald Lake while your portage is on the southerly channel. It’s not too far out of your way and a nice spot. And as you are getting close to your trips end, don’t forget, where you have a bit of current you’ll often have some hungry walleye. A spring trip may not net as many moose as I am leading you to believe there are, but just let the water lilies grow a bit and by early to mid summer they will be as thick as black flies in early June.